My business partner at our webdesign company Refresh Creations recently started talking to me about wiping all data from a computer that I was set to sell on eBay.The computer in question had a fair amount of sensitive information on it and he seemed horrified that I was just going to wipe the hard disk using a Windows format and then sell it on. For all intensive purposes what I was about to do would have been fine but to be on the safe side he introduced me to a piece of software which does a much more thorough job.I thought it might be prudent for him to talk my Click readers through this program as it could certainly come in useful for anyone looking to sell their computer or hard drive on the second hand market. With data security becoming a greater issue on a daily basis it’s important to make sure that you securely remove all your data from your hard drives before you decide to sell your hard drive or donate it towards a charity of your choice. For a great amount of time there have been programs available which can miraculously restore data from a damaged floppy disk, with being the token computer guy in the house at university and still people using this decidedly unreliable format I became familiar with the programs used for restoring corrupted or deleted data from the diskettes. Technically just deleting a file isn’t sufficient to get rid of it permanently; when you delete a file from say Windows XP or any other OS you’re not truly deleting the file. To understand this you need to have a rough idea of how file allocation tables work (this is based on the current format of your hard drive).Unfortunately formatting the drive isn’t necessarily sufficient as data can still be relatively easily restored using an unformatting program which are available readily on the Internet. If you’re intent on selling the drive off to a 3rd party personally I’d recommend the free tool DBAN (Darik’s Boot and Nuke) which is used for securely erasing all data from your hard drive, making recovery of previous data from your drive nigh-on-impossible. DBAN performs a military grade format on your hard drive, conforming to American DOD (Department of Defence) standards. 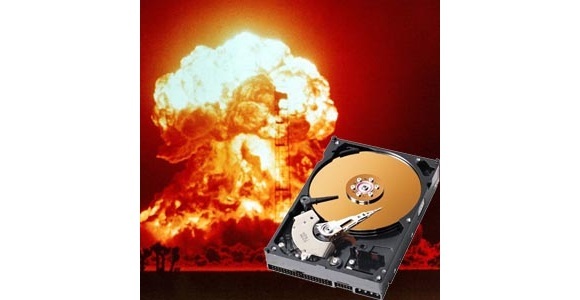 Note it’s name “BOOT AND NUKE” – The CD that you create will be bootable when you turn on the computer with CD booting enabled the program will load automatically and if you’re not careful you will lose ALL data on the drive.This includes the OS and anything else on the drive – ALL data means ALL the data. My thanks go to Ryan Carson for providing this article. Please do be careful with this utility as careless use can cause a loss of data which neither myself, Ryan or the Herald Express will be held responsible.